Liverpool winger Mohamed Salah was given the Puskas award for the best goal of last season at FIFA’s award ceremony in London on Monday. 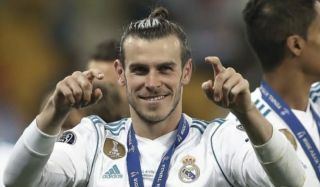 Gareth Bale had been the hot favourite to win the prize after scoring a sensational overhead kick in the Champions League final against Liverpool back in May, but he has been beaten in the final vote by the Reds winger. According to the Sun, Salah won the award for his stunning goal against Everton last season in the Premier League, despite the fact that it was arguably not as good as some of his other strikes throughout the year. Cristiano Ronaldo was also overlooked, having also scored a brilliant bicycle kick for Madrid last term in the semifinals of the Champions League against Juventus. Bale will probably feel the most aggrieved by tonight’s snub, however, with his strike coming on the biggest possible stage at the most crucial moment. The Welshman came off the bench in Kiev to score a brace, which gave Madrid a 3-1 victory on the night, securing the club’s third successive European Cup win. Salah’s goal against Liverpool’s fierce rivals was certainly a wonderful effort and right up there as one of the best goals scored in the Premier League this season, but scores of fans have taken to Twitter taking umbrage with this latest news. Mo Salah has won the Puskas goal award over Bale for his strike against Everton. You would have to search it up to remember it. My player is #TheBest ? ? Sorry, but how has Bale not won the #Puskás Award ??? ?